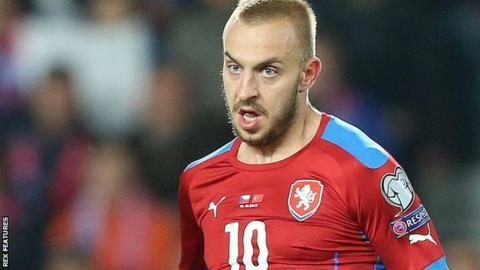 Brighton have signed Czech Republic forward Jiri Skalak from FK Mlada Boleslav for an undisclosed fee. The 23-year-old, who has signed a three-and-a-half-year contract, began his career at Sparta Prague and moved to FK Mlada Boleslav last summer. He has scored six goals in 16 outings this season and is available to face Brentford on Friday. "He's a skilful and technical player," manager Chris Hughton told the club website. "He is also someone we have been monitoring for some time, so we are delighted to have completed the transfer and to welcome Jiri to the club."